It looks like next month's CTC will be 20 minutes at 20 strokes per minute (20/R20). Except for counting myself I’ve got no idea how to count Tth those strokes. Not my cup of tea I’m afraid. 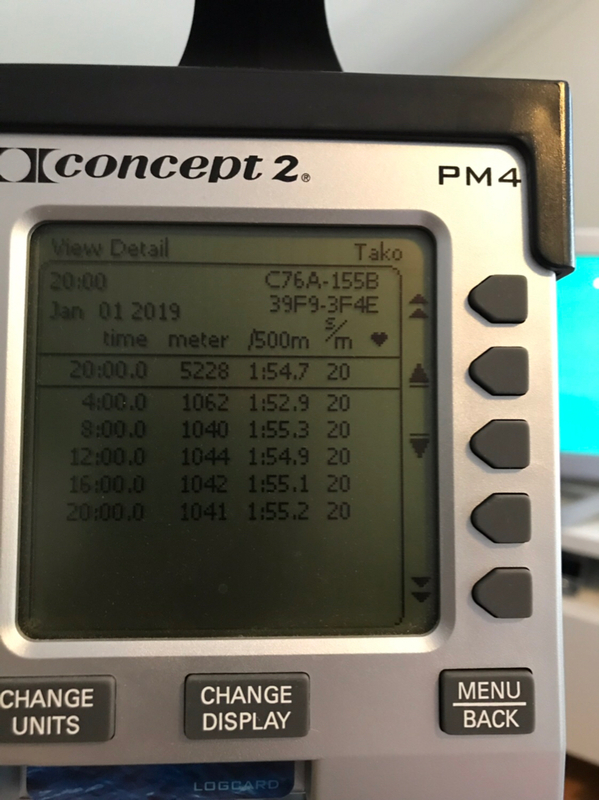 It seems one of the few automated ways to know for certain during the row is to use Ergdata (which in spite of my whimsical previous post, I will be doing). Yes, I saw that Ergdata can do the trick. But I would need a connecting cable and I’m not going to buy one just for this challenge. Not my cup of tea. Never did Rate limited rows. Should one increase the draft factor for this low rate?? Any advice from the experts?? I do R20 by making sure every single stroke is pulled as the clock ticks on 3S (i.e.first at 0, next 0:03, third at 0:06 etc.) As 3 goes into 60 the seconds are the same 20 numbers throughout. Technically might justhit 401 strokes if you don't stop rowing. I am really struggling to rate up, no deliberate low rate capping (have done some R22 and R23 to try and get used to faster rating on longer rows!) but makes this one fine for me if not what my training raeally needs. Just need to make sure well warmed up as the tendency is to pull hard at the start as you can't use rate to get the wheel spinning. What are people's thoughts on DF? I think slightly higher is optimum although some people actually lower drag for R20 to avoid the heavier flywheel after slowing for 2S. Certainly a contrast this month to the IRL! I had a practice go at this yesterday and totally cocked it up, somehow dialling in 5k (I think it was Mr Bee suggesting 5k was his aspiration). Managed 21:57 ish and 3 of the 5 1k splits were 21 strokes but it showed 20 as the total average. I dropped the drag to save my lower back and to (as Iain says) reduce the drag effect between strokes (plus I don't have the leg power of most). I'd left the df on my normal 150 ish, to arrive at the below. I'll test out lower df through the month doubtless. Done with the first challenge this year and I did not enjoy one stroke of it, so very happy that I am done and I probably won’t have a second go at this! Tako, The first time I tried low rate training was in Q1 2018 when I followed the Original 2000m Programme. Getting used to it took a while but it was worth it. Now I really enjoy it and it must have worked because I have had a PB in every month this season! A friend was wondering if the monitor rounds up or down i.e. will 410 strokes show as 20 spm or 21 spm? More seriously the challenge says "averaged stroke rate". So taking Tako's splits above he could have had 2 at 21spm and his average would still be 20 so that's ok? Or are we sticking to 20 spm splits? Or Ergdata 400 strokes? It says "averaged" in the instructions so as long as the TOTAL says 20 then it's OK. They have to legislate for the vast vast majority that do not have/use ergdata. Two at 21 and 3 at 20 would still most likely get you a 20 average (but those 20's could be say 20.4 and the 21's could be 21.4 so it could round up overall). 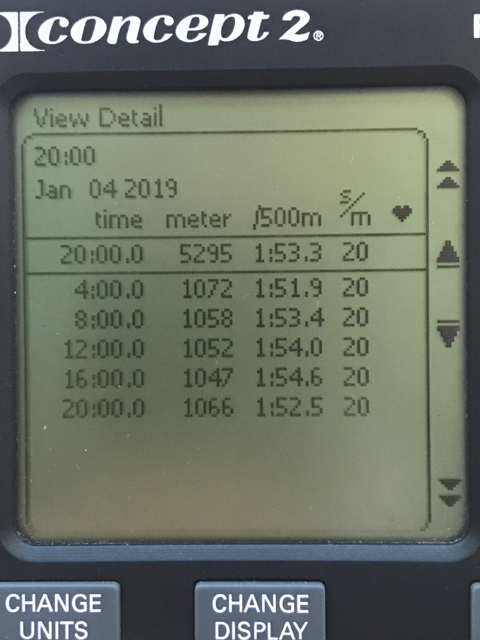 I had 2 goes at the LWT Facebook challenge yesterday (100m @ 18.6s and 18.7s) then had a go at the IRL challenge (1 min - and scraped 300m) and THEN did the 20r20. Suffice to say my legs weren't happy - but managed 4827m which I was a bit surprised at. 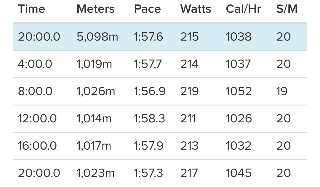 I don't mind the 20spm stroke rate as my heartrate never gets near my max on these events but not having the leg/back/arm power means I lose out overall. Plummy thanks for clarifying. Out of interest I might try an averaged 20 spm v an exact 400 stroke count as I suspect it could make quite a difference. My guess is c100m (9 strokes x 10+m per stroke). Erik, Well done on getting above 5000m and on floating boat I. Given everything you went through in 2018 that's a very nice way to start the new year. Thought I'd join in the early "fun". Dropped the drag factor to 128 to see if there would be any improvement on my test run, and I slipped past my initial goal of 5km. Ergdata assures me that I completed 398 strokes, so there may be the tiniest slither of metres to gain. congrats to all brave finishers ! had a attempt yesterday- but with 75.5kg and after 4mins a tiny scratch in the lower right arm that Demon had a easy game to HD me...maybe in the mid of January a better one ! Used ErgData which is great help seeing the projected finish (keeping it above 5295 all the time) and seeing current stroke rate. Not sure about the PM5, but the PM3 definitely uses an unweighted average of the ratings of the splits. So vary easy to get an advantage on this one. If you entered splits of 19' and rowed R10 for the last minute, you could row R31 for the first 19' and it would still show R20. Also rounds down on each split (although a drive in progress at the end of a split will count in that and the next split), So with 4' splits, you can row 83 strokes and it would still show R20. A strong case that as the definition is clear, any way that meets that is wholly fair! That said, I am not competitive anyway and will stick to 400 strokes!